According to speakers at a recent international poultry conference, antibiotic resistance is a huge threat to human health, and livestock farmers are under increasing pressure to stop using antibiotics altogether. Although this may not have a direct impact on human antibiotic resistance, and presents an enormous challenge to animal health, welfare and productivity, it can be done. 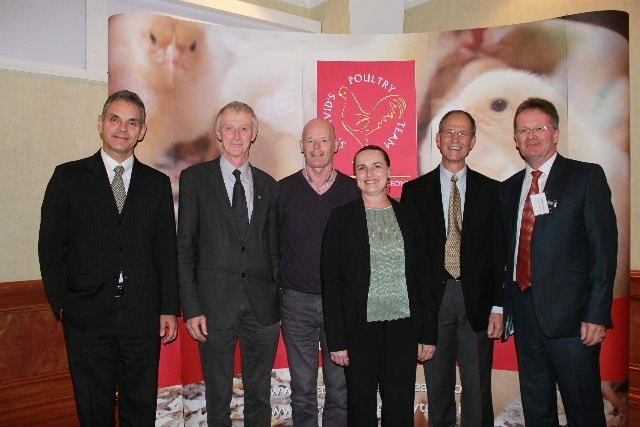 Organised by St David’s Poultry Team, the conference brought together scientists, researchers, vets and farmers from across the globe, to explore the next step in antibiotic reduction. “As a practice we started looking at antibiotic reduction 10 years ago, and now more than 40% of medicines we use to treat infections are not antibiotics,” said partner Richard Turner. Working with professors from Ireland, Belgium and America, Mr Turner has helped to develop a new approach to producing poultry without routine antibiotics, based on using probiotics and acids to boost the birds’ natural immunity. “Vets spend too much time receiving dead birds for post mortems – we need to get back to monitoring flocks and adopting holistic, preventative husbandry,” he said. Professor Colin Hill from University College Cork, Ireland, explained that chickens – and humans – were actually 90% microbes and only 10% chicken or human cells. “Everyone has a different microbiome, assembled from their parents, their environment, their food – there are over 1000 species and they play a key role in health,” he said. Research had shown that microbes could cure a number of different diseases just as well as – or better than – antibiotics. These included porcine salmonella, bovine mastitis, clostridium difficile in humans, and listeria in mice. “By treating with the right probiotics you can kill the pathogens without damaging the microbiome,” said Prof Hill. St Davidʼs 2016 Poultry Conference – Antibiotic Reduction: The Next Step – was held on 16th March at the National Motorcycle Museum, NEC, Birmingham. For more information, call 01392 872932.